Do you know the Bishop of Norwich? According to an old British tradition, vintage port wine is served in a decanter passed at the end of the meal from right to left. When someone forgets to pass the decanter, instead of saying. “Would you mind passing the port,” the British like to ask: “do you know the Bishop of Norwich?” They will then explain that the bishop was a very nice fellow except for his annoying proclivity to forget to pass the port decanter. Henry Bathurst, the Bishop of Norwich from 1805 to 1837, often fell asleep at the table, interrupting the flow of port that fueled the conversation. The British port-wine merchants and producers gather every Wednesday for lunch at the Feitoria Inglesa, an elegant 18th century building in Oporto. It is a place where the slightest hesitation about passing the port results in a lecture about the Bishop of Norwich. One day, two members of the Feitoria Inglesa conspired to invite the current bishop of Norwich to lunch. The bishop arrived incognito. One of the conspirators failed to pass the port and was promptly asked by his neighbor, “do you know the Bishop of Norwich?” He responded “I do, in fact I can introduce you to him because he is sitting at the table!” The bishop rose and told the guests that he was indeed the Bishop of Norwich and that he always passed the port. There’s no better place to appreciate the beauty of Oporto than sitting in great comfort at the Yeatman hotel, sipping a glass of chilled Taylor’s Chip Dry white port before dinner. The hotel was built by the descendants of the Yeatmans, a British family that started trading port wine in 1838. Draped around a hill in Vila Nova de Gaia, near the cellars where priceless vintage ports are stored, the hotel offers exuberant views of the river Douro and the city of Oporto. A stay at the Yeatman is an initiation into the secrets of Portuguese wine. Each room is decorated by a different wine producer. The public spaces are adorned with artisanal artifacts and objects that highlight the connections between wine making and the history of Portugal. The Yeatman’s main restaurant has two Michelin stars. Here, the exquisite food prepared by chef Ricardo Costa harmonizes with extraordinary wines curated by enologist Beatriz Machado, a graduate of the University of California at Davis. The hotel organizes wine tastings, wine masterclasses, and weekly vinic dinners hosted by wine producers. These activities combine with the perfect location to make the Yeatman the perfect pairing for wine lovers visiting Oporto. Port wine used to be sold in austere black bottles with somber labels. Adriano Ramos Pinto, a maverick entrepreneur who entered the port wine trade in 1880, changed all that. He wrapped port wine with sensuous images, elegant packaging, and clever marketing. One of Ramos Pinto’s publicity coups took place in 1922. Two pilots, Gago Coutinho and Sacadura Cabral, planned to make the first aerial crossing of the South Atlantic, flying from Lisbon to Rio de Janeiro. Ramos Pinto convinced them to take a bottle of his port wine on board to celebrate their landing in Rio de Janeiro. On the first two attempts, the airplane sunk near the coast of Brazil. But both the pilots and the bottle were saved. The third attempt was successful and the bottle was finally opened to great acclaim. This and other exploits made Adriano Ramos Pinto so famous in Brazil that a glass of port was often called an Adriano. Tasting port wines at the cellars of Ramos Pinto in Vila Nova de Gaia is a sumptuous experience. You can try splendid tawnies, made by man with the help of God, and divine vintages, made by God with the help of man. A bottle of tawny is a blend of wine from different harvests. A 30-year-old tawny is made with wines that average 30 years of age, so it often contains wine that is 60, 70, even 100 years old. The passage of time is a key factor in the production of great ports. There are 4 million liters of port stored in Ramos Pinto’s cellars. Master blenders use these nectars produced by older generations and save some barrels from the current harvests to be blended by future generations. Vintage ports are produced from a single harvest in exceptional years. They stage for only two years in wood barrels called balseiros. These barrels are very old and very large, holding 60,000 liters of wine. They are used to smooth the tannins without imparting the taste of wood to the wine. Vintage port is bottled and stored in the dark to preserve its rich red color and the taste of fresh fruit. Ramos Pinto also produces alluring white ports. We tried a 7-year white blend that has enticing notes of honey and citrus. There are also wonderful late bottled vintage (LVB) ports. Produced more often than the rare vintages, LVBs are aged in balseiros for 4 years and then bottled without being filtered, so they can continue to improve in the bottle. In 1990, Ramos Pinto was acquired by Roederer, the producer of the famed Cristal champagne. But the company is managed by a Portuguese enologist, João Nicolau de Almeida, son of the legendary Fernando Nicolau de Almeida, creator of the iconic Barca Velha. In addition to wonderful ports, João Nicolau d’Almeida makes two impressive table wines: Duas Quintas and Bons Ares. It is traditional to buy a bottle of port from the year in which one’s child is born for them to make a toast when they come of age. Buying this birthday bottle for your children is a great excuse to visit the Ramos Pinto cellars and a beautiful way to celebrate the passage of time. Click here for the Ramos Pinto web site. The cellars are located at Av. Ramos Pinto 400, Vila Nova de Gaia near Oporto. Portugal’s second largest city and the unofficial capital of the North is called Oporto. The city has an older feel than Lisbon. While much of Lisbon was destroyed by the 1755 earthquake, Oporto preserved its meandering medieval streets and ancient buildings. The Portuguese call the city Porto, while the English call it Oporto. There are two theories about this discrepancy. The most plausible is that the English, hearing the Portuguese say “o Porto” (which means “the city of Porto”), combined the article and the noun into Oporto. The most romantic is that the name came from visitors falling in love with the city and sighing “Oh Porto!” We side with the romantic theory. 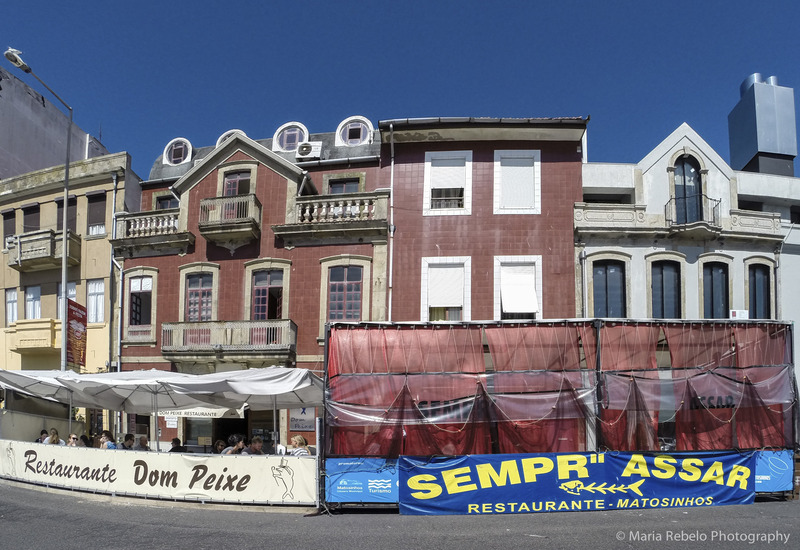 Click here for a guide of where to stay and what to do in Oporto. One of the most beautiful beaches in Portugal is Miramar, near Oporto. It has a long stretch of sand bathed by green and blue water. 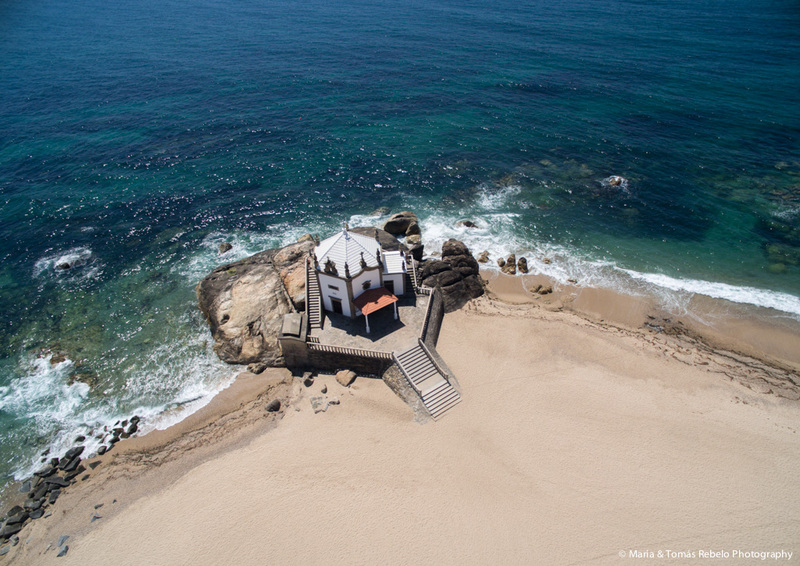 But what makes this beach so special, is an old church built on rocks by the sea on the same place where there was once a pagan temple. As we entered the church courtyard, we felt surrounded by the sea; dazzled by its sight, soothed by its sound, intoxicated by its scent. It is easy to understand why this location has been a place of worship for centuries. Faced with such immense beauty, how can we not give thanks to its creator?